Omni Cable 14/2 FPLP fire alarm cable has a voltage rating of 300-Volts. 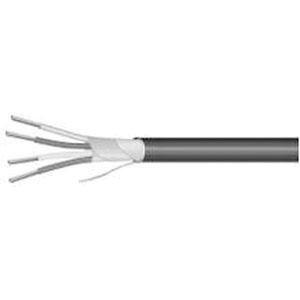 This Plenum rated cable has aluminum/polyester overall shielding with drain wire. The bare copper cable has color coded OMNIPLEN insulation with an insulation thickness of 0.009-Inch. The PVC jacket in red color, has a thickness of 0.019-Inch and nominal diameter of 0.212-Inch. It is suitable for fire alarm systems, smoke detectors, burglar alarms and dedicated fire protective circuits. The fire alarm cable meets UL Type FPLP and NEC Article 760 standards.